Golf solitaire with a skiing based twist. Having been hooked on Fairway Solitaire since its release, I've pretty much done everything possible. So, Ski Solitaire has come along at the perfect time to reinvigorate the solitaire loving part of my mind. Despite the name, Ski Solitaire is Golf Solitaire. Cards are laid out and must be cleared in a set order to unlock further back cards. An icy theme comes into play here, with some frozen and needing to be melted with a special sun card. Special gate cards can be used at opportune moments to extend play. Ultimately though, it's like a lot of games of solitaire, requiring the player to match numbers in ascending or descending order. Multipliers are possible by creating runs. These then go towards the player gaining more money which is used to buy new upgrades and, in some cases, unlock new courses. A nice twist comes in the form of unlocking new courses. It's not always about just completing the previous course. Some courses require objectives to be completed, such as creating a sufficiently large run or earning a lot of money through one course. It mixes things up a little without deviating from the Golf Solitaire concept too much. In all, there are 100 levels to play through so it'll certainly take players a while to complete Ski Solitaire. There's also always that urge to go back and earn more money from earlier stages, in order to buy new upgrades. 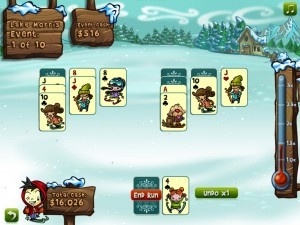 The general appearance of Ski Solitaire is pretty cute, with the choice of using different characters for the game. I couldn't really find any difference between them other than looks, which is a bit of a missed opportunity. I would have loved to have seen an extra tactical edge implemented through this. Ski Solitaire is pretty similar to Fairway Solitaire but without the allure (or possibly, the threat) of in-app purchases. Pay the price to buy it and the player gets everything that Ski Solitaire has to offer. The added focus on completing objectives also keeps things feeling fresh and a little different. For card game fans such as myself, it's a fun mix.